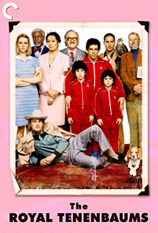 Despite a top-drawer cast, the studied eccentricity of Wes Anderson’s over-achieving, under-functioning family feels a little contrived – but that’s just me, and I’m clearly in a minority. This off-kilter Manhattan exists in a strange parallel universe. 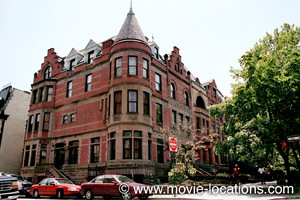 The Tenenbaum house, at ‘111 Archer Avenue’ can be found in Harlem – it’s 339 Convent Avenue at 144th Street. The zebra wallpaper in Margot’s (Gwyneth Paltrow) room, by the way, is based on the striking patterns at the since-closed restaurant Gino, which stood at 780 Lexington Avenue at East 61st Street (you can see the real thing in Woody Allen’s Mighty Aphrodite). 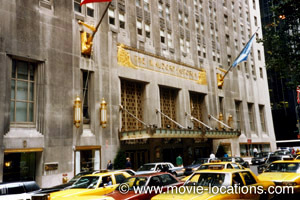 The ‘Lindbergh Palace Hotel’, from which Royal Tenenbaum (Gene Hackman) is finally evicted after a 22 year stay, is the Waldorf-Astoria Hotel, 301 Park Avenue, seen also in in Woody Allen’s Hannah And Her Sisters, Scent Of A Woman, Analyze This, and briefly in Nicolas Roeg’s Bad Timing. The old United States Customs House, 1 Bowling Green at Broadway, is transformed into the ‘City Public Archives’, in which the young Tenenbaums camp out. 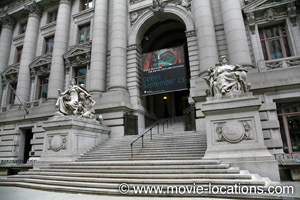 Now housing the National Museum of the American Indian, the building is also featured as the casino in Batman Forever, as the museum in Ghostbusters II and as the ‘Social Services department’ in Adam Sandler comedy Big Daddy. Richie Tenenbaum’s (Luke Wilson) disastrous final tennis match was filmed on the Centre Court of the West Side Tennis Club, 1 Tennis Place, Forest Hills, Queens. You can’t reserve a table at the restaurant where Royal has an edgy meeting with Margot (Gwyneth Paltrow). It’s Grand Prospect Hall, 263 Prospect Avenue, Park Slope in Brooklyn, which you can see again in Francis Ford Coppola’s The Cotton Club).